These brownies are slightly moister and not quite as dense as most Passover brownies. One of the reviewers on Epicurious said they would use this recipe all year round, not just for Passover. And well, they’re good … for Passover brownies. Read: I wouldn’t make them any other time. Preheat oven to 325°F. and butter an 8-inch square baking pan. Chop unsweetened chocolate and in a small heavy saucepan melt with butter over low heat, stirring until smooth. Cool mixture 10 minutes. In a small bowl whisk together cocoa powder and cake meal. In a large bowl with an electric mixer beat together eggs and sugar until thick and pale and beat in sour cream and melted chocolate mixture. Add cocoa powder mixture and beat at low speed until just combined. Stir in chocolate chips and walnuts with a wooden spoon and spread batter evenly in baking pan. 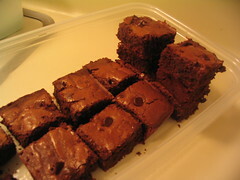 Bake brownies in middle of oven 35 minutes, or until a tester comes out with crumbs adhering. Cool brownies completely in pan on a rack before cutting into 16 squares. Brownies keep layered between sheets of wax paper in an airtight container at cool room temperature 5 days. Notes: I omitted the nuts and added extra chocolate chips. I also doubled the recipe. If I make these again, I would probably add an extra tablespoon of sour cream to make them even moister. melted marshmallows and a drizzle of melted chocolate. down into the melted marshmallows and drizzle of melted chocolate. By making your own Desserts especially at Passover Time, you can have your Cake and eat it too and know what your eating is not coming out of a Box.